In a way, Bridal Lehengas can be our very own answer to the British era skirts. For reasons known only to its creator, a lehenga brings out the children in a woman- So much so that we tend to look at femininity in an all new level. What is it that binds a woman with a Lehenga? Is that the simplicity? Or is it the way fashion has defined the lehengas of today that they are both contemporary and yet traditional? Or is it the innumerable combinations that can be used as tops to compliment a lehenga? Well, no one really knows the answer, but a bridal lehenga is sure to make heads turn at an event when you grace its presence. Bridal Lehengas are created and designed intricately to avoid boring and mundane practices and are crafted to perfection as per the times we live in. There can be a no better compliment to a woman when the bridal lehenga syncs with her and makes her the hot theme of the day. Bridal lehengas have a universal appeal and are one of the most important ethnic wears of the region. It showcases the culture rich heritage our country and it can be tailor made to suit any needs. 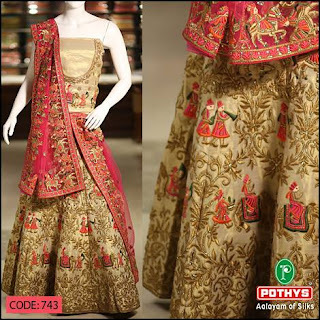 We at Pothys have some of the finest handcrafted bridal lehengas especially for you to make that special D-day even more memorable. Be spoilt for choices at our premises and get floored by the exhilarating combinations we have in our array for you. Straight cut, Fish cut or mermaid style – Just go with the flow and alleviate your fashion sense to the next level. Walk with grace, Make egos go flat and triumph high on your chosen day! Take a walk down our aisles for rediscovering the traditional yet modern attire called bridal lehengas at your disposal.